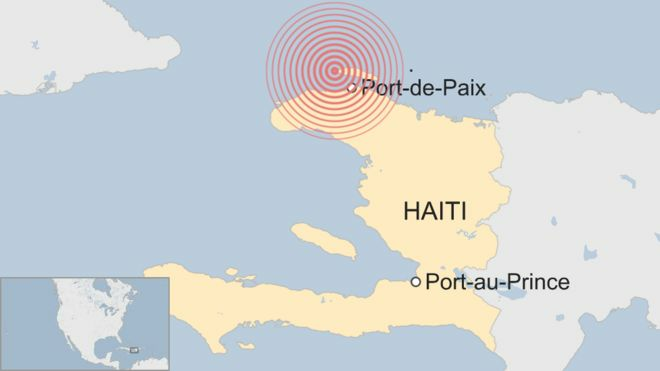 (BBC) At least 10 people have been killed by an earthquake that struck off the north of Haiti, officials say. The magnitude 5.9 quake was one of the strongest to hit the Caribbean nation since a major tremor in 2010 killed more than 200,000 people. Several buildings are reported to have been destroyed. President Jovenel Moise has urged people to remain calm. Government spokesman Eddy Jackson Alexis said a disaster response task force had been set up. The US Geological Survey said the epicentre of the quake that struck late on Saturday was about 19km (12 miles) north-west of the city of Port-de-Paix.